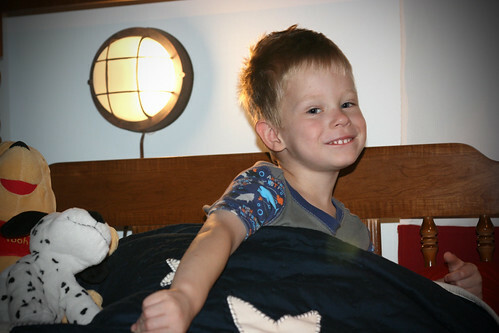 One of my big projects this summer was decorating Sean's big boy room. All summer long we were working on potty training, and this was his reward. He helped me as much as he could, but most of the time I worked by myself. This is one of our spare bedrooms, and since we were moving Sean to this room we didn't need to finish by any set time. He stayed in his "baby room" until it was complete. One of the nice things about doing this room is we have Jeff's old bedroom set from when he was a kid, and it's in near perfect condition. A little orange oil and elbow grease it was like new. We did re-cover the platforms on the bunk beds. 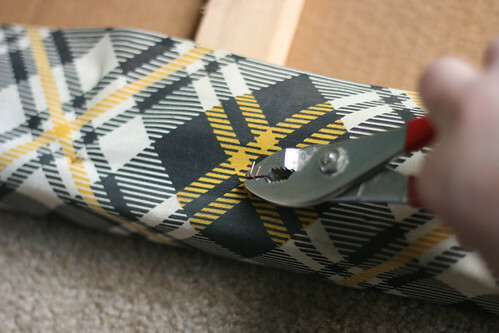 This black and gold plaid was the original fabric. I picked up a nice heavy cotton in navy blue with white pinstripes from Joann Fabrics in the clearance section. As good as new, I tell ya! 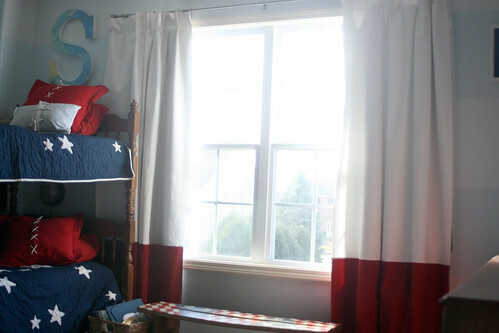 Before this was Sean's big boy room, it was a spare bedroom that was decorated in red, white and blue. My mom & dad's lake house up in St. Germain, WI had a Americana room and when they sold the house all of those boxes came to my house. We have an amazing Americana quilt that is cross-stitched by my Grandma Greninger. Such a treasure! But not for little boys. 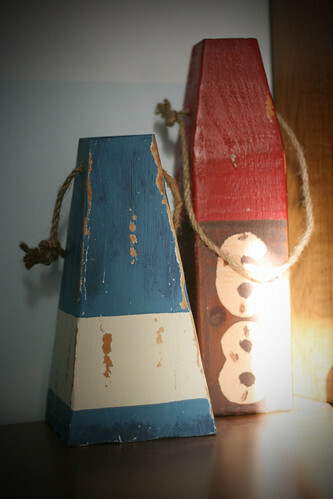 I really liked the idea of keeping it red, white & blue... but with a nautical slant. 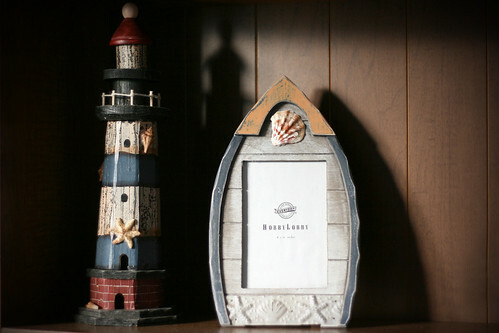 Jeff loves lighthouses so we had a little lighthouse table lamp. And wouldn't you know it, he had a ship's wheel mirror too? 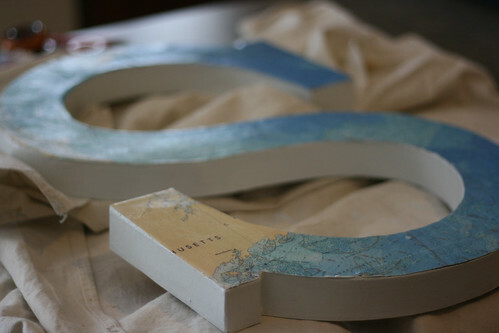 One of my favorite little projects was this big letter S. I was inspired by all of the DIY map projects on pinterest. And since we were doing a nautical room, I searched for a depth chart map that was cool and interesting. I kept trying to make it relevant to Sean... but living in the midwest doesn't lend itself to cool bodies of water. This one is off the coast of Massachusetts. I love the different shades of blue. I simply printed this off on my inkjet, and then modge podged it to the letter. It's kind of hard to tell in these pictures, but the walls are painted with blue stripes -- a very light blue, almost white and a shade darker. LOVE the stripes. The quilts on his bed are from Pottery Barn Kids. I browsed the internet until all hours of the night trying to find a reasonable substitute for these expensive puppies. To no avail. Jeff finally said, "Are these quilts he'll have for the next 5-10 years?" And I replied, "Until college!". Done. 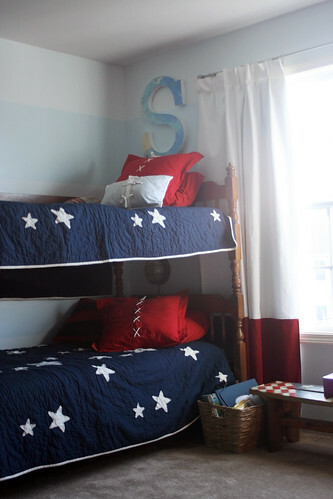 The cute nautical red pillow covers are from Lands End. I picked these up at their warehouse clearance event up in Wisconsin this summer. I was so excited when I saw them! They fit perfectly in his room. The curtains were custom-made. I had the red canvas fabric from when Jeff & I made custom roman shades for our bedroom, and I picked up the white canvas from Hobby Lobby. I didn't trust myself to sew these, and found a seamstress online who lives about three blocks from my house. Done. The bench underneath the window is from the house up north. Very cute, fits perfectly and very utilitarian. Oh, and that wall lamp under the top bunk? My favorite addition to the room. It was inspired by this porthole wall sconce from Pottery Barn Kids. It's no longer available, but this summer it was $80. Yowza! So again I was on the hunt for a less expensive substitute, and happy-chance on this round bulkhead lamp on amazon. Jeff installed it, and added a dimable switch so Sean can read in bed if he likes, but mostly we use it as a night light. 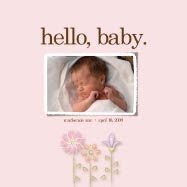 I love, love, love this in his room. See that awesome ship's wheel mirror? Perfect. And that lamp in the corner fits nicely too. Most of the decorations in the room were here before, with a few new additions from Hobby Lobby. Including this cute little boat frame with no picture in it. Please tell me I'm not the only person on the planet who has empty frames like this in their house? The lighthouse above is from Hobby Lobby too. You gotta love their 50% sales. 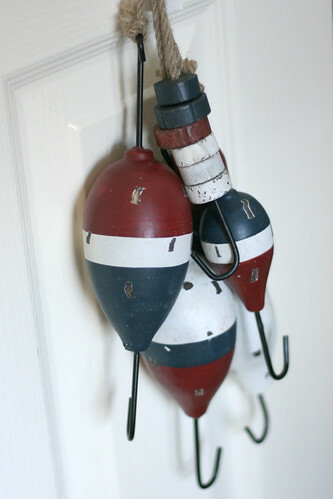 The buoys and the fishing tackle are from there too. We were at Hobby Lobby so often between Jeff's birthday party and this big boy room project that Sean would ask every morning, "so, are we going to hobby bobby today momma?" I originally struggled with how to fit everything into the space. It's not a small room, but it's certainly not huge either. One wall is entirely closet space and the other wall is pretty much all windows. 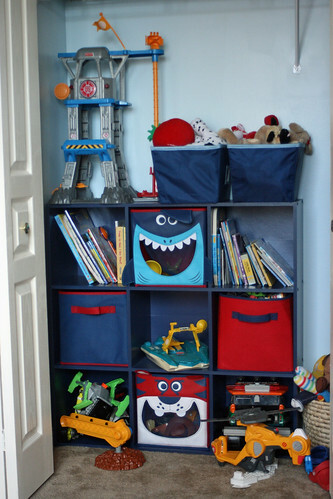 Between the bunk beds, and the dresser/hutch and desk I was troubled with where toys could be stored. I picked up this nine cube storage unit from Target, and once I got it assembled I realized I could place it inside one side of the closet. And the nice part? I can close the door, and the mess disappears!! 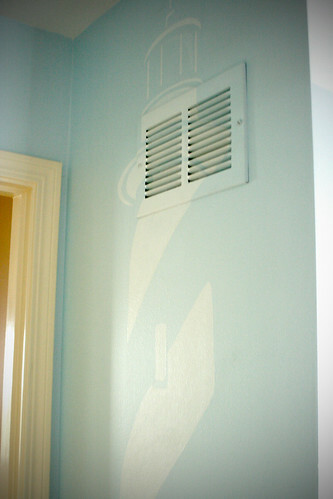 Finally, the piece de resistance was the silhouetted lighthouse painted on the wall right inside the doorway. Uncle Mikey designed and painted this for Sean. It was really hard to photograph, and I couldn't get the whole thing into the frame. But trust me, it's awesome. Oh, and Sean loves his new room. He settled into it very easily. 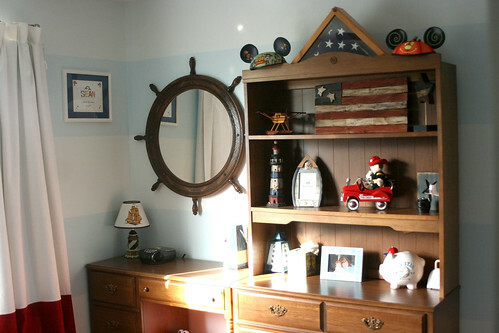 And while he likes the whole nautical theme, he can't help but add his own touch. 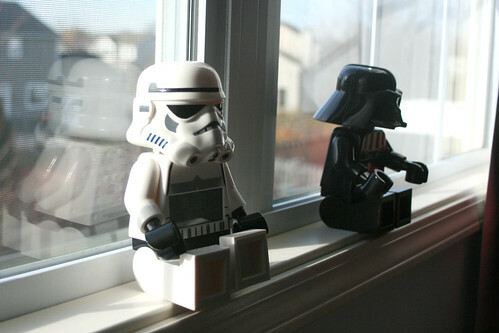 Like these Star Wars clocks he received from Grandma Shelly. Love it. I have a feeling the room will change and grow as Sean does. But no matter what, the quilts are staying.